Jewels have always sparkled at auction and – as pawnbrokers and jewellers based in the heart of London – we keep a keen eye on what’s happening where. There has been an upward trend in the prices that jewellery can fetch at auction and so Hopkins and Jones are delighted to showcase outstanding auction performances of recent years. Someone had a very Happy Christmas, back in 2011, with the purchase of La Peregrina, a natural pearl jewel with an impressive back story. With a history that stretches back over 500 years, La Peregrina is a pear-shaped pearl that was first bought by Philip II of Spain in 1582, passed through the hands of eight Spanish kings over 200 years and then fell into the hands of Joseph-Napoléon Bonaparte, King of Naples and Sicily and elder brother of Napoleon Bonaparte. Bought by Richard Burton in 1969, for $37,000 at auction in New York, Burton gave La Peregrina to his then-wife, Elizabeth Taylor, as a 37th birthday present. Reset by Cartier as the centrepiece to a necklace, the piece was auctioned as part of Elizabeth Taylor’s collection. Little surprise, perhaps, that it fetched $11,842,500. Not only does the pearl glimmer as a sound investment but it also helps to shine a light on the work and worth of the Cartier brand at auction. Small can also be beautiful, as demonstrated in 1987 with the sale of The Hancock Red – a tiny diamond, weighing only 0.95 carats, which was cherished for its colour: Fancy Purple-Red. Fancy diamonds are a rarity, with one in 100,000 diamond qualifying as a ‘Fancy’ colour. When it comes to red diamonds, these are so rare that you may never see one in a lifetime. A fifth of a gram, The Hancock Red was bought by Mr Hancock, a Montanan farmer, for $13,500 in 1956. In 1987, it fetched $880,00. Colour makes life more interesting when it comes to diamonds and jewellery. Rings also perform well, as they often auction as stand-alone items. In May 2016, the Oppenheimer Blue, became the most expensive jewel in auction history, selling at Christies in Geneva for CHF 56,837,000 ($57,973,000). The diamond took the name of its former owner, Sir Philip Oppenheimer, whose family had been a driving force in the diamond industry for generations. He could have any diamond he wanted chose this one for its perfect hue, impeccable proportions and rectangular shape. Classified as ‘Fancy Vivid Blue’ by the Gemological Institute of America, the highest colour grade and colour intensity for blue diamonds, the Oppenheimer Blue is the largest Fancy Vivid Blue diamond to have ever appeared at auction. 2018 enjoyed continued auction records for jewellery, with jewellery sales for Christie’s and Sotheby’s totalled over $906 million in auction sales. One of the highest profile pieces to be sold at auction in 2018 was the “Winston Pink Legacy”. The pink 18.96-carat diamond ring set a world record for the per carat price of a pink diamond, fetching $50.3 million and purchased by the Harry Winston jewellery. 2018 saw the superb opportunity for collectors to bid for pieces from the personal collection of the last queen of France, Marie Antoinette. 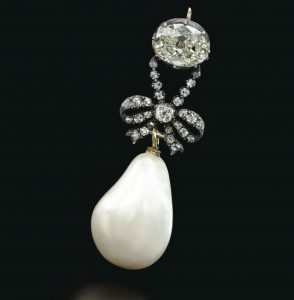 A natural pearl, as with La Peregrina, this once belonging to Marie Antoinette -and now attached to a diamond pendant- sold for $36.1 million. With a pre-auction high estimate of $2 million, this natural pearl fetched the second highest price achieved for a jewel at auction in 2018 and it set a new auction record for a natural pearl. The entire lot fetched $53.2 million and included the royal jewels of the Bourbon-Parma family, Marie Antoinette’s diamond-set monogrammed ring and a lock of her hair. The jewels have been held privately and out of the public eye for 200 years, with the auction noted as one of the most important royal jewellery auctions in history.